Its that time of year when we all try to spend more time together as a family. As a child growing up we always use to play board games a lot more at Christmas time. Coupled with the fact that Hubby and I use to play Monopoly a fair bit before kids (normally with a couple of bottles of red wine). 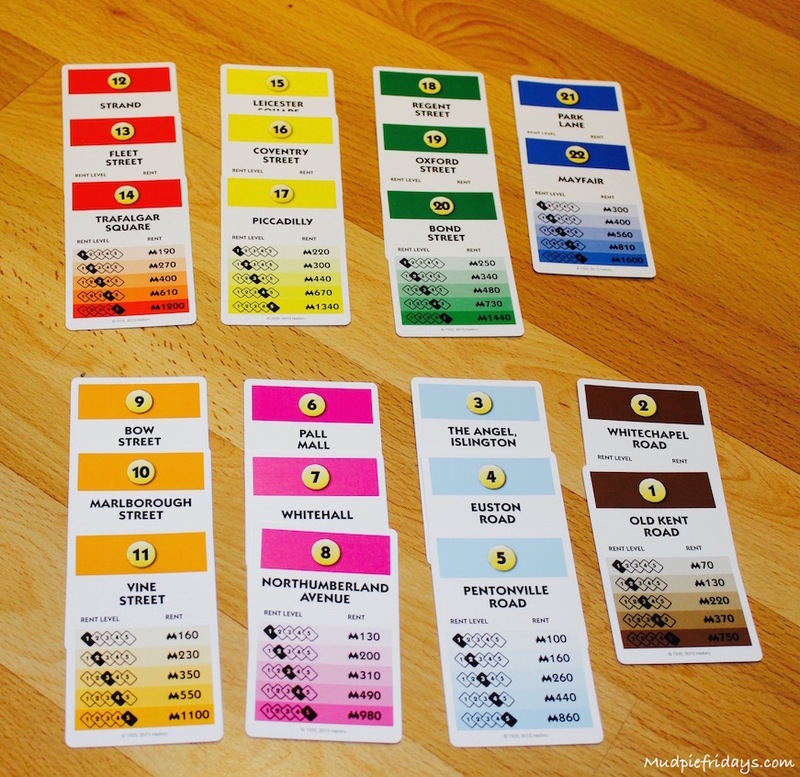 I was really interested when asked to review the latest edition of Monopoly. Would we love it like we loved our old battered red and white set? Or would adding new technology to a classic ruin it? So firstly whats changed? There is no longer paper money (sob) instead there is a much more practical bank card approach. After all lets face it, our set had lost a number of notes and if more than two people wanted to play we were scrabbling around for the last few £1! 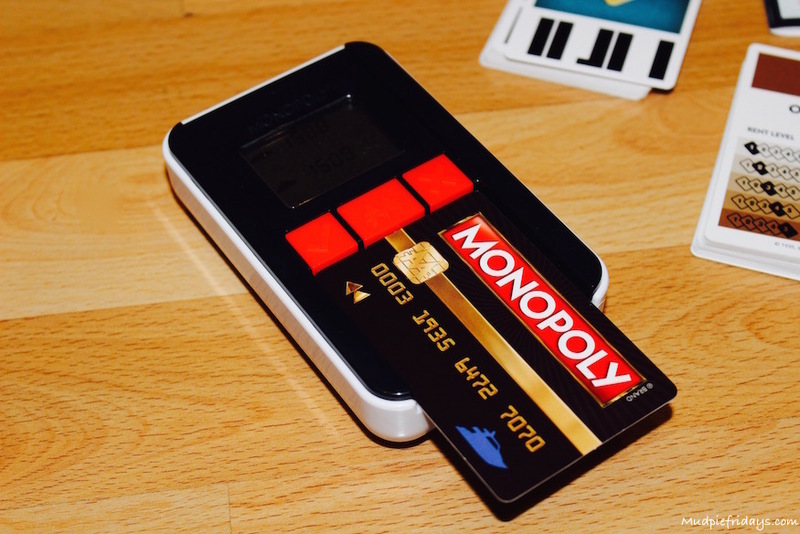 Each player has a bank card with a picture of their piece on it which is placed on the handset to preload the cash. 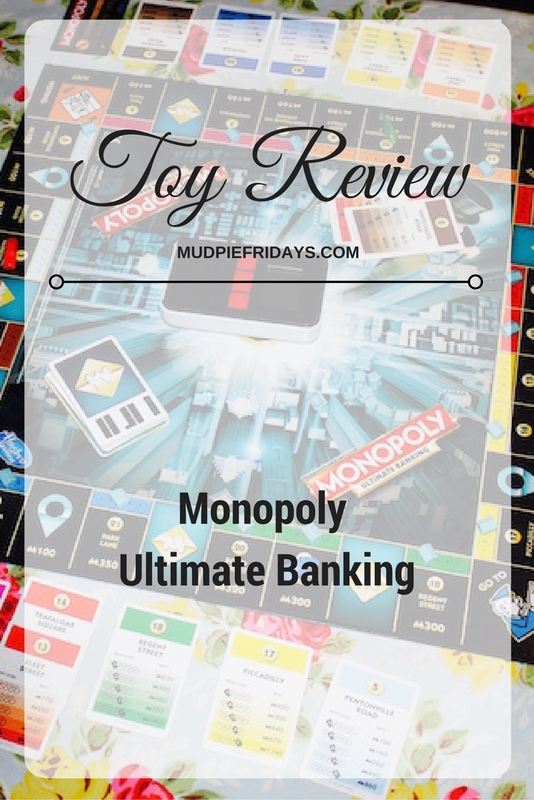 The hand set is integral to the game and although it doesn’t have the same feel as being banker and counting through the crumpled bank notes, it is a lot more practical and much quicker to set up. There is no longer a requirement for a banker. The board has changed, water works and stations don’t exist. You no longer have hotels, instead there are five levels of building for each property. You can go up a level if someone (including yourself) lands on your property or if all three are purchased. However we did find that that event cards tended to have a bigger impact on rent reviews. The handset keeps a record of all of this, so if you didn’t want to or couldn’t be bothered you don’t need to use the actual houses. 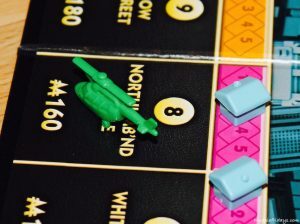 Bonus – no longer are you hunting for another red hotel or watching as the dice ploughs through rows of neatly placed houses. Everytime you land on a property you have to buy it or auction it. 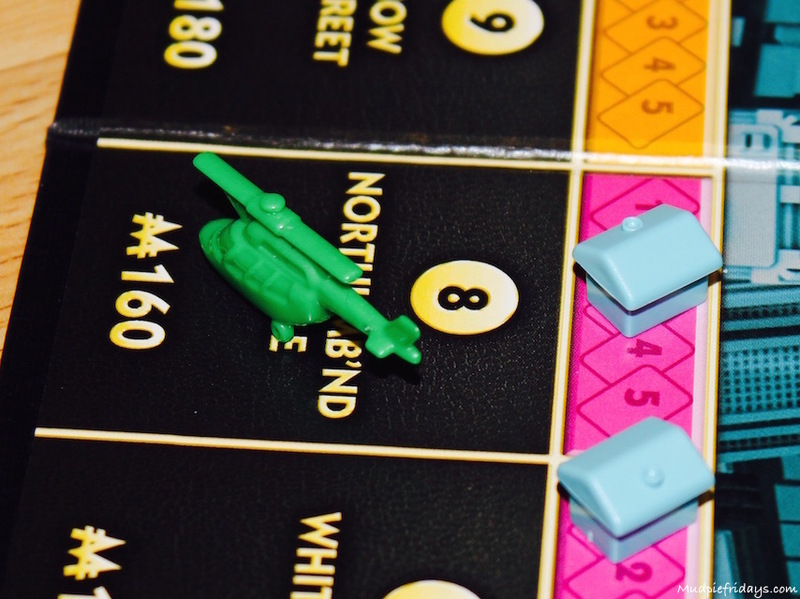 As we rarely play with the maximum number we have tended to buy each property. This means that the game only lasts about an hour before one of us goes bankrupt. In our younger days we would leave a game of monopoly out for several nights! Being shorter does mean that its an ideal length for Monkey to join in. Despite it being for eight years plus Monkey with a little direction was able to join in playing in his own right. Since theres no longer much maths involved as the handset does it all for you. I particularly like he fact that Monkey can join in easily and have had great fun doing it. 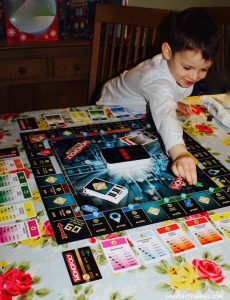 I think he really enjoys it because his perception of monopoly is that it is a game for older kids. Although I love the traditional game I can see why this has been introduced. It now competes in the same space as other games which are traditionally much shorter in length and opens the game up to a much wider age range. On the downside there is no space for bending the rules. We use to add in any money generated from the chance cards/jail to the centre of the board and if you landed on free parking you would get whatever was in the kitty. 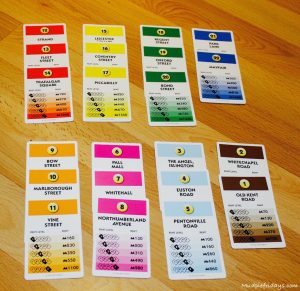 This added an extra element to the game although not in the rules use to add a little extra excitement and could keep the game going for a lot longer. We have always viewed Monopoly as a social game so there was a little bit of bending the rules, i.e. proping up a younger family member when really they should have gone bankrupt. The nature of the new game has changed this. Saying that it has definitely been met with approval and we would never have been able to include Monkey in the old style game. You can not longer cheat! Or bend the rules which means it does become very much a game of luck over strategy. I would recommend this to families with younger children and I would think that hey could actually change the age range to 6+ rather than 8+. 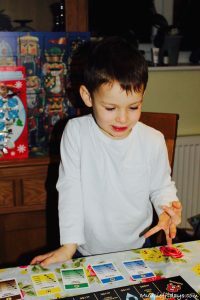 Saying that on the rare occasion where we actually get time alone and choose to play a board game I suspect our old battered red and white box will come out. 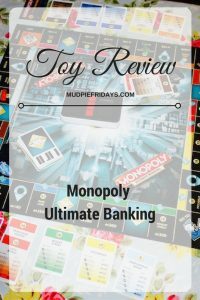 We were given a the game Monopoly Ultimate Banking for the purpose of this review, all opinions are my own. We love Monopoly here too….It’s such a classic game. 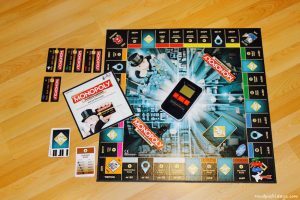 I was rubbish at Monopoly as a child – I just never had the patience to see it through!